The roadrunner has a dove-like "coo" that is slow and descending. 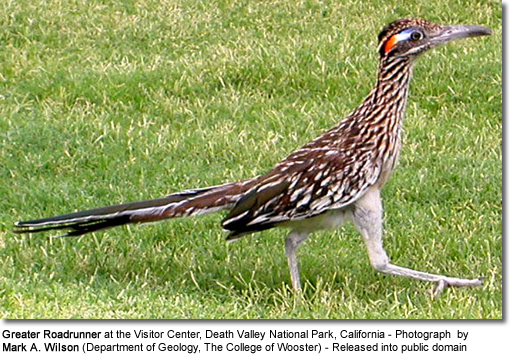 The roadrunner is an inhabitant of the deserts of the Southwestern United States, Mexico, and Central America. 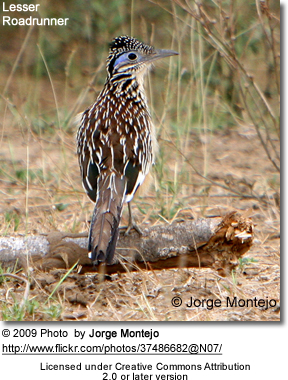 Habitat: Roadrunners live in arid lowland or montane scrub and are often widely dispersed in the dry open country with scattered brush. 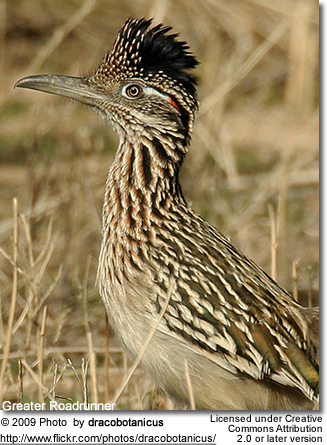 Migration: Roadrunners are non-migratory birds that reside in their breeding area all year. Roadrunners are omnivores and are opportunistic. Their diet normally consist of insects (such as grasshoppers, crickets, catepillars, and beetles), small reptiles (such as lizards and snakes, including rattlesnakes), rodents and small mammals, tarantulas, scorpions, centipedes, spiders, small birds, eggs, nestlings, and fruits and seeds like prickly pear cactus and sumac. 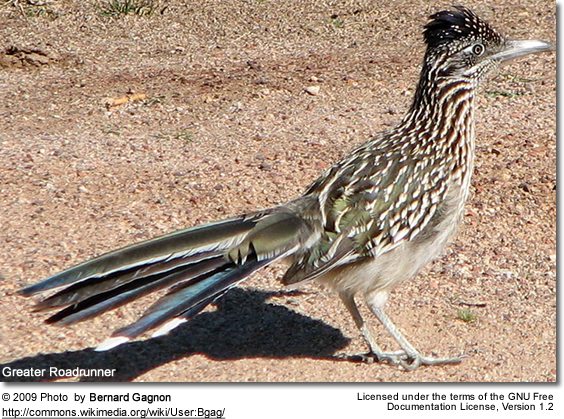 The lesser roadrunner eats mainly insects. Roadrunners forage on the ground usually running after prey under cover, they may leap to catch insects, and commonly batter certain prey, like snakes, against the ground. Geococcyx sp. is the only real predator of the tarantula hawk wasps. Nest: Roadrunners nest are often on a platform nest composed of sticks (nest may sometimes contain leaves, snakeskins, or dung). The nest are commonly placed in a low tree, bush, or cactus. Clutch: Hatching is asynchronous and average a 2-6 egg clutch (the Lesser Roadrunners clutch size is typically smaller). Eggs are generally a white color. Parental care: Roadrunners have bi-parental care. Both sexes incubate the nest and feed the hatchlings, but males incubate the nest at night. For the first one to two weeks after the young hatch, one parent always remains at the nest. After the hatchlings are two to three weeks old they leave and never return to the nest. For a few days thereafter, the parents and young forage together. Reproductive Season: spring to mid-summer depending upon species and geographic location. During the cold desert night the roadrunner lowers its body temperature slightly, going into a slight torpor to conserve energy. To warm himself during the day, the roadrunner exposes dark patches of skin on its back to the sun.